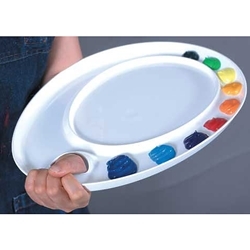 This extra-large, ellipse-shaped palette is 17" x 12.375" in size. Acrylic colors peel off it and oil colors wipe off clean. It features a separate mixing area to keep paint uncontaminated. The palette edges have raised lips to prevent spillage. The rubberized feet prevent skidding.